The Beijing Motor Show traditionally warrants nothing more than a collective "meh" from the mainstream automotive media, but it certainly caught our attention this year. Bigger and better than ever, automakers from China and abroad have done everything to bring attention to their cars but put a gigantic stuffed elephant in one. Oh, no, wait. They've done that, too. But why shouldn't they show off — as the Chinese market continues to mature into it's teenage years, we've watched it shed some of the awkwardness of puberty, but still manage to showcase that youthful wide-eyed optimism with some truly innovative, unique and beautiful concepts. Still, like pimples, a cracking voice and a random desire for adorning oneself with chrome bits n' pieces, this teen still shows off it's rebellious side with vehicles that are completely bizarre, ridiculous knock-offs of popular designs or in most instances, both. Follow us below the jump through as we watch the coming of age tale that is the 2008 Beijing Motor Show. Usually, when one manufacturer succeeds with a car another will try and take that idea and make their version different and better, a la the Ford Mustang and Dodge Challenger. In China, when a company comes to market with a successful car rival automakers will merely make a poor imitation of it. Thus we present the Lifan 320, a car that somehow manages to maintain the original elements of the MINI we knew and loved, and manages to make it horribly and inexcusably terrible. As if the Great Wall Kunna Electric concept car wasn't cute enough, there's a stuffed Panda in the passenger's seat. Though we don't think they're indicating you should pick up Panda hitchhikers (you shouldn't — they always want to control the radio), the company has embraced the idea that small cars always look odd and it's just easier to design that into the car than out of it. Though American undercover cops occasionally tool about in convertibles (think Miami Vice), we can't think of too many convertible, two-seater marked police cars here in the states. Nevertheless, that didn't stop the Chinese company that now owns classic British carmaker MG from making this MG TF Police Car. Though technically next door at the Police & Equipment Show, this hot little cop coupe was a hit and could be seen picking up political dissidents any day now — only one at a time. There's nothing special about a Chinese Smart Car clone as there are tons of them made by Shanghuan Auto. This time, however, the company's Kamino corporate rulers have one-upped themselves with the Harley Davidson Edition. That's right, it's a Smart knockoff with the knockoff of a Harley Davidson painted on the side. Genius! It even isn't big enough to hold a Harley — just like the F-150 pickup adorned with similar accoutrements stateside. This, technically, isn't a knockoff. Does it look like a Chinese cab? Yes. But Chinese manufacturer Geely has a contract with London Taxi Inc. to build the Black London Taxi. Totally legit. Though most think of the vehicle as a means for someone driving you around, if you need to get there in a real hurry then this TX4 "hot rod" model is the way to go. It has everything a real London cab needs, including a picture of Big Ben in the back. Tally Ho! Though some Chinese companies might be tempted to take advantage of lax intellectual property laws and outright steal the popular design of the Lexus RX series SUV, automaker Huanghai should be congratulated for resisting the urge. Instead of taking the entire car, they merely took the rear 75% of a Lexus RX and grafted on the front 25% of a Pontiac Torrent for their Huanghai Faster SUV. To make it even more interesting, it's powered by a Mitsubishi engine. For reasons that currently elude our understanding, the car is flanked by car models dressed as hot cops. Maybe they just didn't fit in the MG cop car from earlier. ">Hafei Saibao V isn't the most original sports sedan (there's more than a touch of Mazda3 and Lancer Ralliart), we have to give them credit for taking all of the sporty visual cues they could think of — from a gigantic spoiler to super sporty wheels — and fit them all on one car. And if that wasn't enough, they also flanked it with not one, not two, but four models dressed for the prom. That's because when you want to sell a car to sporty guys you need as many gowned models as possible. It&apos;s A Jeep! No, It&apos;s A Hummer! 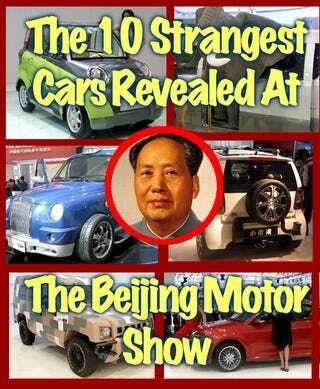 No, It&apos;s The Beijing Auto Works B60! If you think the BAW B60 Jeep — or BJ — looks a lot like an actual Jeep, you'd be correct. Chrysler and BAW worked together back in the day to co-develop this Jeep for non-Civilian use. Of course that development partnership fell through more than a few years ago, but why let a silly thing like trademarks, copyrights and international intellectual property laws get in the way? That may explain why it looks like the BJ has taken on a bit of Hummer and Land Rover DNA on the front fascia — BAW hopes it'll confuse anyone into thinking the other 90% is pure unadulterated Jeep. But, much like the originals, this formerly Military vehicle is ready to find use in the home of a minimally endowed real estate agent. As much as we Americans may love the idea of the minivan, the Chinese love the idea of the mini-minivan. But just in case should you think that this Hafei Minyi isn't big enough for you and your family, the company has put a stuffed baby elephant inside the strange little van to simulate the awesome carrying potential of a minivan crossed with a b-segment econo-box. Of course, even a baby elephant is a touch too big for the Minyi, so you can see the poor animal's stuffed behind sticking out the other end in a way we think would probably be a turn off for potential buyers. Kissing cousins to the BAW B60 "BJ" Jeep above, this military Jeep has what we'll call an "interesting" camouflage pattern. As opposed to the high-detail of the pixelated multicolor look of US Military vehicles, the pixels here look to be a few inches across. Was it perhaps designed to patrol the Lego cities of the future or play in some "War Games"-like game of Tetris? Despite the questionable paint scheme, the hybrid powertrain's far superior to your average Hummer. No sense sullying the air with more pollutants than necessary in your standard scorched-earth campaign, eh?